The EU has launched several initiatives to help fight climate change. As forests play a crucial role in capturing carbon dioxide from the atmosphere that would otherwise contribute to global warming. The EU is working on plans to make every member state compensate for emissions caused by deforestation. Parliament and the Council reached an agreement in December 2017, which MEPs voted in favour of during the April plenary session in Strasbourg. The Council will still need to approve the legislation as well before it can enter into force. Read on to find out more about why forests are so important and what Parliament is proposing to offset CO2 emissions caused by deforestation. The EU boasts 182 million hectares of forest, covering 43% of its land area. Forest coverage can vary considerably from one member state to another. In fact just seven countries account for more than 70% of the EU's forested areas: Finland, France, Germany, Italy, Poland, Spain and Sweden. Forests provide numerous ecosystem services: they help to protect the soil from erosion, form part of the water cycle, protect biodiversity by providing a habitat for numerous species, and regulate the local climate. Healthy forests are also crucial for fighting global climate change, because they capture carbon dioxide from the atmosphere. The new legislation on the land sector aims to harness this potential as part of the EU's climate policy. What sector will be affected by the legislation? The new plans concern the land use, land use change and forestry - also sometimes known under the abbreviation LULUCF - sector and comprises mainly of forest land and agricultural land, as well as land whose use has changed to, or from, one of these uses. This sector does emit greenhouse gases. For example through land-use changes, especially when forests are used for something else like arable land, when trees are cut, or because of the livestock on agriculture land. However, it is also the only sector that can remove CO₂ from the atmosphere, mainly through forests. 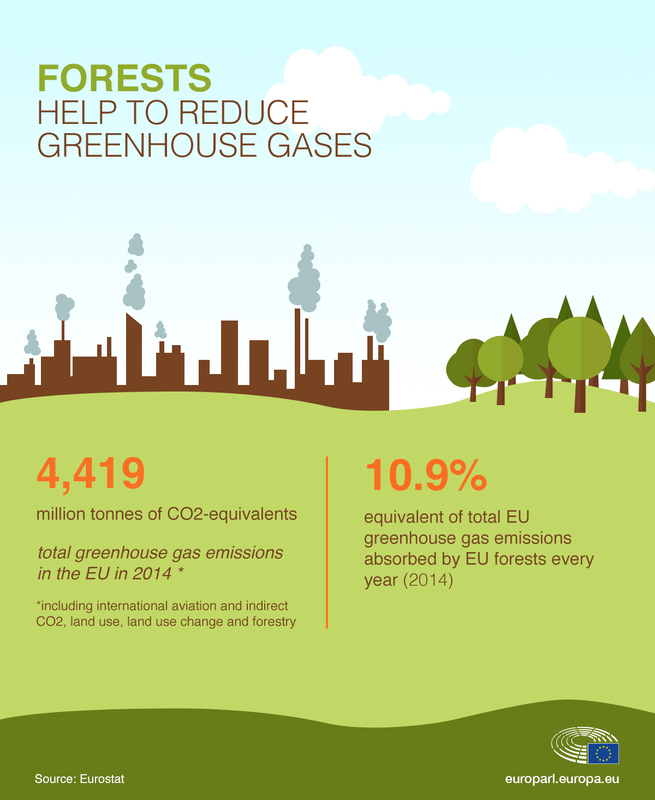 EU forests absorb the equivalent of 10.9% of total EU greenhouse gas emissions each year. What is Parliament pushing for? 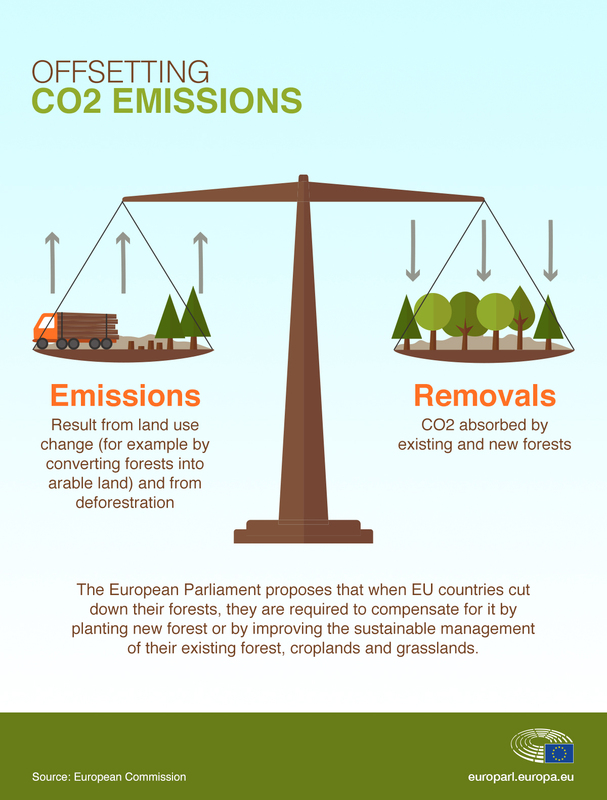 MEPs want to prevent emissions caused by deforestation and they also call for obliging each EU country to compensate changes in land use, which lead to emissions of CO2, by better managing or increasing their forests. The proposed regulation establishes a legal framework from 2021 onwards and is in line with the Paris Agreement. The proposal to deal with the effects of land change on forests is one of three proposals to help honour the EU's commitments under the Paris agreement on climate change. The goal is to cut greenhouse gas emissions in the EU by at least 40% in all economic sectors by 2030 compared to 1990 levels. The other two proposals concern a revision of the EU's emission trading system, which covers emissions from the industry, and the Effort Sharing regulation, which covers sectors not covered by the emission trading system, such as transport, agriculture, buildings and waste management. The EU is also working on a proposal to set new limitations for cars' CO2 emissions. This article was originally published on 13 September 2017, but is updated from time to time.